Selena Lasota makes a move. The senior was a major contributor in the Cats’ win Friday. 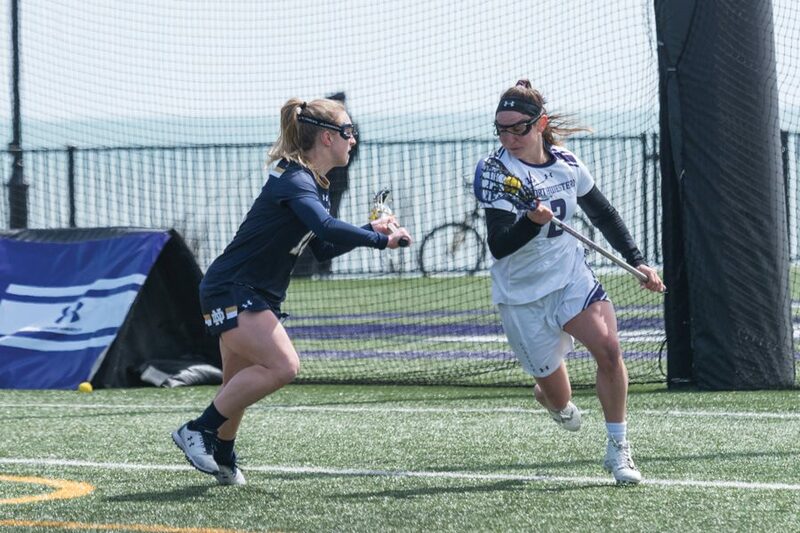 Shelby Fredericks was a cornerstone on offense for four years at Northwestern, but it only took half a game for sophomore midfielder Brennan Dwyer to show that the team can play as well without her. Though serving as the backup for then-senior Fredericks in 2018, Dwyer put together a big performance in NU’s regular season opener, racking up 12 draw controls, two goals and two recovered ground balls. As a result, the Wildcats (1-0) outplayed the Cardinals (0-2) in the first period, dominating draw control and ground ball battle. A big of part of that energy was Dwyer, who helped lead the Cats to a 21-11 victory. The Cats’ collective energy in the first half allowed them to play at a faster tempo and rack up more shot attempts. The Cats scored on their first possession of the season, as freshman midfielder Izzy Scane ran all the way down the field with the ball and put it to the back of the net before 20 seconds had expired. She picked up two goals, three ground balls and four draw controls in her first career game. The sizeable contributions from Dwyer and Scane freed up senior attacker Selena Lasota to shine. Lasota, who received All Big Ten recognition last year, finished the first game of her final season had three goals and an assist in the first period alone. The second half brought a different story to the game. The Cardinals recovered as many draw controls as NU after the half and allowed only one free-position shot. After being down 15-4 at halftime, Louisville had an encouraging stretch to bring the game within single digits before the final buzzer sounded. In the first regular season game played in the Ryan Fieldhouse, Dwyer said throughout in the game the Cats benefitted from a full crowd. The Cats hope to carry over the energy they displayed in the new environment as well as seal up their defensive breakdowns next weekend, when they will host unranked Dartmouth and No. 19 Duke.